When I was a kid one of my favorite video game genres was the RTS. Some of my favorite games growing up were WarCraft and StarCraft. While most people liked these games for the combat, I was always a bigger fan of building up my base. I might not be as big of fan of the genre as I once was but I am still interested in trying out new games that bring something unique to the genre. This is why I was interested in Warparty as it looked like an interesting twist on the genre. Basically the game takes the genre back to prehistoric times while adding in dinosaurs. 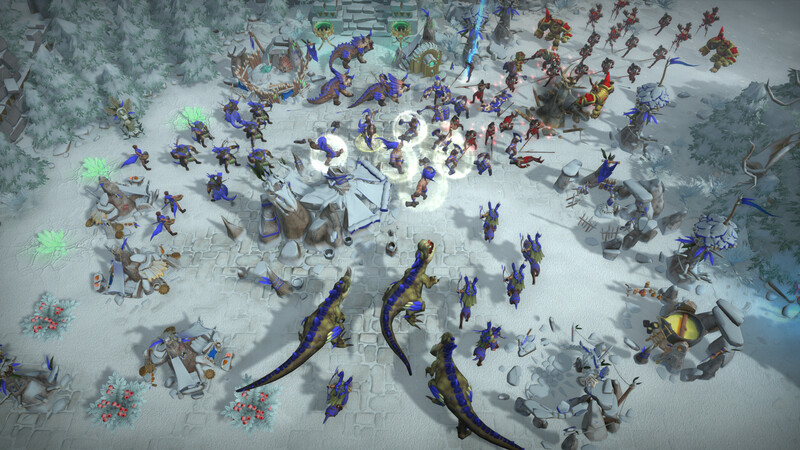 How could an RTS featuring dinosaurs not interest you? Warparty might not be as good as some of the masters of the genre like StarCraft but it is a satisfying and fun RTS that fans of the genre should enjoy. We at Geeky Hobbies would like to thank Warcave and Crazy Monkey Studios for the review copy of Warparty used for this review. Other than receiving a free copy of the game to review, we at Geeky Hobbies received no other compensation for this review. Receiving the review copy for free had no impact on the content of this review or the final score. In the world of Warparty, during prehistoric times, there was a civilization which thrived due to its access to technology and magic. This civilization dominated the world until it eventually collapsed and was lost to time. Many years later human tribes came upon their technology and magic and tried to harness it for their own goals. You will control one of these tribe leaders as you try to use the power to lead your people to glory. At its core Warparty is very similar to your typical RTS. It all begins with your worker units. You will use your workers to gather the two main resources in the game: food and crystals/gems. These can be obtained by harvesting them from deposits on the map or there are structures you can build which when worked by workers can generate resources. The workers use these resources in order to build various buildings which can be used to train additional units or provide your tribe with various upgrades. After you build up your base it is time to start creating your army. The type of units that you can create somewhat depends on the faction you choose. The units in the game do tend to break down into a couple groups though. Each faction pretty much has a basic infantry and ranged unit, a healing unit, an advanced infantry and ranged unit, and a mounted infantry and ranged unit. On top of this each faction has a unique leader which can use special abilities when they have acquired enough power. Once a player has assembled their army they use it to destroy the other factions in the game. Speaking of factions Warparty has three unique factions. First are the Wildlanders who tend to have an advantage when it comes to building your base. Next comes the Necromas which have control over the dead. Whenever they kill units they summon zombies who fight on their behalf. Finally there are the Vithara who focus on protecting nature. They have the ability to take control over wild dinosaurs and turn them to their cause. While the three factions share quite a bit in common, they also play quite a bit differently. Each faction is unique enough that you should be able to find a faction that most closely relates to your gameplay style. If you played other RTS games before you should already have a good idea of what to expect out of Warparty. Warparty is unique in some ways but it is clear that the game took inspiration from other RTS games like StarCraft, WarCraft, and Age of Empires. The game takes some mechanics from each game while also adding in some of their own mechanics. If you are a fan of any of the games I mentioned, I would be surprised if you didn’t also enjoy Warparty. I wouldn’t say that it is as good as StarCraft, but I had a lot of fun playing Warparty. I was quite impressed overall since the game was made by a smaller developer. For this review I ended up playing the Playstation 4 version of the game. At first I was a little leery about this as the RTS genre doesn’t have the greatest track record with consoles. For the most part Warparty’s controls actually work quite well with a controller. The game succeeds because the designers were wise to use dials to let players choose which buildings to build along with other similar decisions. You just need to use one of the triggers to bring up the menu and then select your desired choice. The rest of the controls are pretty straightforward as you just select buildings and units and give them commands with the press of a button. The only area where the controls could be a little better is when handling units. I give the game a lot of credit as it has some smart ideas that allow you to select units quickly. There is a button that automatically selects idle workers and another that selects all of your military units. Once you have your units selected you can either have them all move to a location, or you can give the command that they should attack anything they encounter while moving to the destination. The only problem with unit selection is that it is harder to select individual units or subsections of your army. You can hold a button which creates an ever expanding circle which will select all of the units inside the circle. This usually works but there are times where you have to manipulate your troops to select specific units. This is the one area where I think the PC version of the game may be superior to the console versions. Otherwise the console versions should hold their own against the PC version of the game. I began this review by talking about the game’s prehistoric theme and for the most part the game does a good job utilizing it. The theme doesn’t really impact the gameplay very much as there aren’t any mechanics that are specific to the theme. You could have applied any other theme to Warparty and it wouldn’t have changed the gameplay. It is still pretty fun to play in a prehistoric setting though. Also who doesn’t want to control an army filled with T-Rexes and other dinosaurs. The graphical style is also quite good especially for an indie game. For an RTS game the individual units are pretty detailed and the locales look nice as well. Like a lot of RTS games Warparty has several different gameplay modes. The basic gameplay doesn’t change between the modes but each mode does emphasize different things. Let’s begin with the campaign mode. With there being three different factions, there are three different campaigns in the game. Basically each campaign follows the leader of the faction on their quest to use the ancient powers for their own goals. Being an indie game I have to admit that I was a little skeptical of the campaign. I assumed that each campaign would basically be the same missions with some slight changes for each faction. I was pleasantly surprised that the missions for each faction are unique and are based around each faction’s strengths and weaknesses. Unfortunately I can’t give you a definitive length on the campaigns due a pre-release bug that I encountered where the game didn’t save my progress in the campaigns. The last time I played the game this issue seems to have been fixed so it should no longer be a problem. It did prevent me from playing past the first couple missions for each campaign though. I am not sure how many missions are in each campaign but they should take quite awhile to complete as a lot of the missions are pretty long. The lengths of the missions do differ but I would say that most of them take at least 20-30 minutes. Speaking of single player modes, the game also includes a skirmish mode. The skirmish mode is basically what you would expect out of a RTS. You build up your base and try to destroy the enemy AI. There isn’t a whole lot to talk about with this mode as you should know what to expect from it if you have ever played a RTS. The final single player mode is the survival mode. I was actually really excited about this mode. One of my favorite types of missions from RTS games are the survival missions where you have to hold out for a given amount of time while enemies swarmed your location. I always liked these type of missions as they emphasized base building which is what I always liked most about this genre. While I really liked the idea behind this mode I was a little disappointed by it. The mode is still fun but it is not as good as I thought it would be for a couple reasons. First I would never recommend playing the easy difficulty as the mode is really dull as it takes close to a half hour before things even begin to become challenging. I am guessing the more difficult levels are more exciting but I found the mode to be kind of boring. I think the bigger problem is that the enemies can attack you from five different directions. I think the mode would have been more enjoyable if units would have only come from two or three directions. With five directions you have to spread yourself too thin and can’t really focus on building a significant defense in any of the directions. You then have to either arbitrarily spread your forces or you need to regularly move your forces from one entrance to another. On the topic of the single player I would say the computer AI is pretty good for the most part. I did notice some times where enemy units would just wait outside my base instead of attacking. For the most part though the enemy AI can be quite challenging. The campaign missions that I played were on the normal difficulty. For just being on the normal difficulty I have to say that some of the missions have a lot of back and forth. It was a true grind making progress in some of the missions. The AI would constantly send waves of enemies that were hard to fight back. To ultimately beat the levels you have to be patient and take any progress that you can make. With this just being the normal difficulty, I am really curious how good the AI is on harder difficulties. At this point a lot of people are probably wondering about the multiplayer. The multiplayer allows players to play against other players online in different game modes. The game also has ranked multiplayer and leaderboards. I unfortunately can’t testify to the multiplayer as I haven’t played it. Based on the rest of the game though I would guess it would work pretty well. One thing I do worry about is if the multiplayer will catch on. If there aren’t a lot of online players it might be hard to find a matchup. This did seem to be a problem for the game during its early access period. I am hoping the full release combined with the console releases will add to the player count as I think Warparty could develop a strong community of players. Warparty doesn’t revolutionize the RTS genre but it does about as good as you could expect from an indie RTS game. Warparty clearly took inspiration from other RTS games but it adds in its own twists as well. The gameplay shares a lot in common with a lot of other RTS games, but it is still really fun. It is sometimes a little hard to manage groups of units, but otherwise the game plays surprisingly well with a controller. The game also gives you quite a few different modes. The game includes a unique campaign for each faction with each mission feeling unique. The survival mode is a really good idea even though it is not quite as good as I was hoping. The game provides players with plenty of options for single player. I am a little concerned about the multiplayer though as there aren’t a lot of online players right now. I hope the game develops a strong community because Warparty is a good RTS. If you don’t like the RTS genre, you probably won’t like Warparty. If you like RTS games though and think the theme is interesting, I think you should enjoy your time with Warparty and should consider picking it up. Puts its own twists on the classic RTS formula. Works surprisingly well on consoles. It is sometimes hard to select specific units in your army. The game needs to develop more of an online base of players.